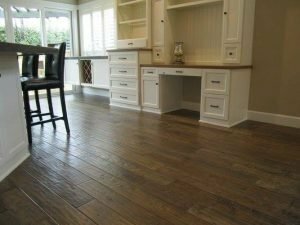 With so many flooring options available today, it can be hard to determine which material is the best fit for your home. Hardwood, laminate, carpet, tile, and other materials all have great features, but the right choice for your home is the one that will meet all of your needs. So how do you figure out which flooring type is the right one for you? Here are five things I think you should consider. Do you have kids? Pets? Is the area you are covering a high-traffic area? You probably won’t want to choose a plush carpet. Resilient flooring is a great choice for active homes, and carpet holds up better in low traffic areas. Let us know what your lifestyle is like, and we can recommend a floor that will last. You want the floor in your entryway to pop, but it also needs to stand up to outdoor elements and be easy to clean. If you don’t want your feet to touch the cold floor first thing in the morning, you might want carpet in the bedroom. New flooring in your laundry room? Make sure it can resist water. Choosing the right floor for your location can save money and headaches in the future. Of course, budget is always a concern when you’re doing any kind of renovation project. 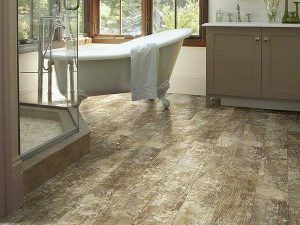 When you’re choosing flooring, you will also want to consider the life of the product (how many years until you have to replace it? 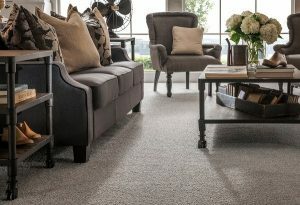 ), maintenance, and things like padding if you’re installing carpet. We have flooring products at a wide variety of price points, and I’m confident we can find something that fits your life and your budget. Not only will you be walking on your floor every day, you’ll be looking at it every day. You want something that will look great and fit your décor. Many homeowners choose somewhat neutral products that are versatile as furniture and wall colors change. However, the most important thing is finding something you love and enjoy seeing every day. You may be in love with that chartreuse shag carpet, but if you’re planning on selling your home in the next few years, you may want to reconsider. Investing in a product like quality hardwood flooring can increase the value of your home and raise your selling price when the time comes to move. Our team can advise you on the best choices available if you’re looking to add to the resale value of your home. The best way to get a handle on the flooring options available to you is to stop by our showroom and chat with our design team. We can help you determine the best product for your situation, and then we’ll oversee every stage of the installation. We’re open 9 to 5 Monday through Friday, and 9 to 1 on Saturdays. You can also contact us right through the website. We look forward to helping you find the perfect floor!